(This article was published by Gene Watch, Volume 20 Number 3 May – June 2007. Since the year 2000, in many parts of New England — especially Vermont, Maine, and Massachusetts — there has been renewed interest in bringing resolutions to town meeting on a range of national and global issues. Measures concerning the USA PATRIOT Act, the military occupation of Iraq, impeachment of Bush Administration members, and global climate disruption have appeared on many town meeting warrants. 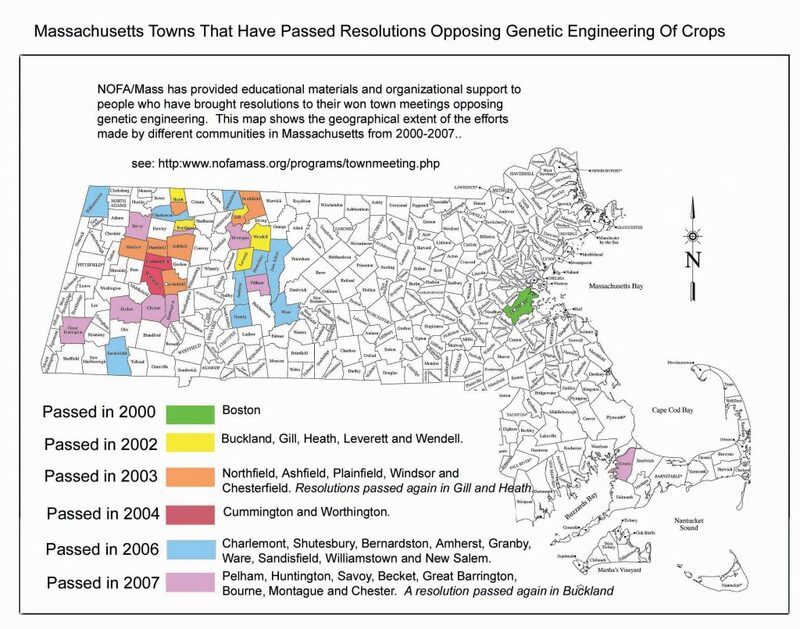 One of the issues that has gained the most attention at New England town meetings in recent years is agricultural genetic engineering (GE). Since 2000, one hundred and twelve towns and cities in New England have passed resolutions opposing GE food and farming. Citizens in Massachusetts are currently expanding these efforts, taking lessons from similar efforts in neighboring states, and learning their own lessons. In Vermont, where town meeting advocacy against GE crops first took off on a large scale, 85 towns and cities have passed resolutions, exerting significant influence on state policy. In 2004, Vermont passed a first-in-the-nation law requiring clearer labeling of all GE seeds sold in the state. Then, in May 2006, the Vermont House and Senate passed landmark legislation that would have permitted farmers to sue GE crop manufacturers under private nuisance law in cases where damages from GE contamination that exceeded $3,500 could be demonstrated. On May 15, 2006, however, Governor Jim Douglas vetoed the bill, disappointing many farmers and local agriculture advocates. In Maine, where two towns have passed measures on GE foods and crops, residents of Montville voted in 2006 to amend their town plan to prohibit the growing of GE crops. This may be the first such measure by a New England town to carry the force of law within its jurisdiction. In Massachusetts, another major effort has been underway to get town meetings to take up genetic engineering. Led by the Northeast Organic Farming Association of Massachusetts (NOFA/Mass), 21 towns have passed resolutions since 2002 calling for a series of policy turnarounds. The resolutions in Massachusetts and other parts of New England have usually made three demands: 1) mandatory labeling of all GE foods by manufacturers; 2) strict liability protection to strengthen farmers’ legal rights when dealing with biotechnology corporations; and 3) a moratorium on further growing of GE crops until independent scientific evidence proves them to be safe, and they can be demonstrated not to harm family farms. The main activity of this resolution campaign has been educational. Local organizers collect signatures to put the resolution on the town warrant, distribute literature, reach out to the local agricultural community, organize film screenings and speaking events, and encourage their local media to run stories about their efforts. That such a municipally-based campaign should emerge in New England is no accident. New England town meetings have roots that date back before the American Revolution and are unique governing institutions, whose openness and democratic character has made them lively sites of political action. To this day, in most town meetings, anyone who is registered to vote in the town can freely attend, speak on matters pertaining to the meeting’s agenda, and propose articles for debate and decision. Town meeting is a face-to-face form of government in which the citizenry can participate directly, unlike federal and state representative bodies and even city councils. In Massachusetts, town meeting is the official system of government in the majority of municipalities — 302 towns throughout the state. In Vermont, there are 246 towns that are governed by town meeting. These campaigns have helped politicize an issue that is often claimed by scientists as their exclusive domain. The town resolutions challenge the idea that the struggle over biotechnology is merely a matter of divergent scientific opinions, but establish that it is also a conflict about democracy, politics, and power. Many of the resolutions point out, for instance, that GE technology has been marketed without undergoing thorough, long-term, and independent scientific testing. The federal government’s regulatory system fails to protect the public in part because it is thoroughly entwined with the biotechnology industry. Its profit interests distort scientific priorities in developing new agricultural technologies and assessing their safety. Scientific amateurs and experts alike have a stake in the issue, because the biotechnology industry threatens our local agricultural economies and our health. One common argument that has been made against these resolutions is that towns do not really have the power to enact them, and that this is something that must be dealt with on the federal level. As an organizer myself, I have pointed out that the federal government has shown itself to be consistently unresponsive to the threats these crops pose, and that local organizing is essential if we are going to ever change that. Another pro-GE argument is that genetic engineering is “just another tool in the toolbox of farmers.” This ignores the arguments against GE crops such as the dangers they pose to the environment and human health, and the way the technology has been developed to consolidate corporate control over the food supply through patents, terminator technology, and dependency on agrochemicals. It is driven by the economic argument that, if GE crops can save farmers money in the short term, they should not be banned. This argument needs to be reframed, as farmers’ economic concerns are not so far away from the ethical, political, health and ecological concerns of the activists, many of whom are farmers themselves. The same problems affect both groups. The biotechnology industry is using its legal authority, under corporate patent law, to strong-arm farmers into abandoning the practice of seed saving. Moreover, the industry is using its economic clout to make farmers more dependent on proprietary herbicide-tolerant GE seeds and the accompanying chemical inputs. But as fuel costs increase and food distribution conglomerates continue to pay farmers less money than it costs to produce food, these relations of dependency and servitude to corporate agribusiness are putting farmers in jeopardy. In Massachusetts, dairy farmers — who grow the vast majority of GE crops in the state — are in dire straits financially. In the early 1990’s, there were roughly 800 dairy farms in Massachusetts. Today, a mere 183 dairy farms remain. In 1996, GE crops were first commercialized on a massive scale in the United States, but they clearly did not help the survival of dairy farmers. Despite the commonalities that different groups share within agricultural communities over the problems they face, agreement over GE crops within these communities won’t be achieved until new solutions for the farm crisis become palpable. One dairy farmer who used to grow GE crops told me privately that he thought the only way for a dairy farm to survive economically in the Northeast is to go organic. I saw the same person publicly oppose efforts to put a resolution for a moratorium on GE crops. In our culture, the idea that short-term economic gain takes precedence over long-term ecological sustainability has tremendous power. In the absence of substantial state aid for organic transition, NOFA/Mass, our sister chapter, NOFA/VT, and the Maine Organic Farmers and Gardeners Association all provide technical assistance to farmers who want to start using organic methods. These essential programs appeal primarily to a farmer’s own self-interest to transition to organic milk, which gets a much fairer price than conventional milk. Meanwhile, our communities have a strong stake in this transition away from industrialized agriculture. With these elements in place, the movement must now ask itself what kinds of political changes are possible at the municipal level that not only oppose the encroachment of threats like biotechnology onto our food system, but support the political changes needed to preserve land for organic farming. Ben Grosscup works with the NOFA/Mass Social Action program, organizing with farmers and advocates for sustainable agriculture throughout Massachusetts. In 2006 and 2007, he has been coordinating a major Massachusetts-wide campaign called The Town-to-Town Campaign on Genetic Engineering, as well as coordinating a campaign to stop the USDA’s National Animal Identification System. In 2002 and 2003, he worked as an intern with the ISE Biotechnology Project, which spearheaded the Town To Town Campaign on Genetic Engineering in Vermont. The Vermont Campaign served as a model for the Massachusetts campaign led by NOFA/Mass. To reach the author, contact ben.grosscup@nofamass.org. To reach NOFA/Mass, contact 978-355-2853 or nofa@nofamass.org.